People come to Hawaii on vacation and they assume it’s a perfect paradise. There’s certainly plenty of beauty to go around, but financially, most people struggle. Wages are low, and the cost of living is astronomically high. We see new businesses come and go quite regularly, and when it’s a restaurant that we particularly love, seeing their windows boarded up is quite sad. When we found out Kiss My Grits had closed down, I was a bit distraught. Where was I going to go for a constantly full mason jar of sweet tea and biscuits the size of a cat’s head? There were so many things on their menu I never got to try, and so many things I wanted to eat over and over again that I’ll never be able to have. In a fit of despair, I decided to recreate my own version of one of my favorite biscuit sandwiches from Kiss My Grits. Despite living in the South for several years, I never became an expert biscuit maker. I also don’t have the time, equipment, or patience to make my own pork sausage. I do, however, know where to find all this stuff in the grocery store. 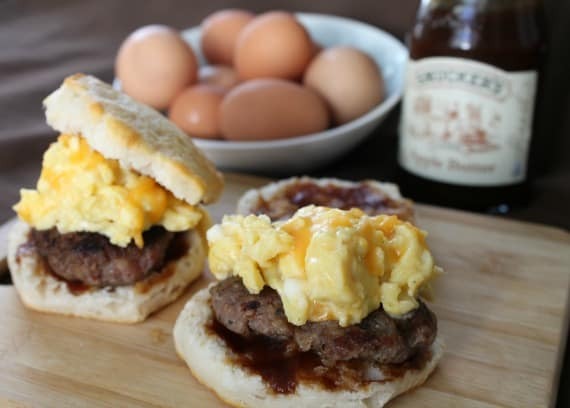 When I first read about this combination of spicy sausage, fluffy eggs, sharp cheddar, and apple butter on a buttery biscuit, I was skeptical. Normally I don’t like sweet things anywhere near my eggs. I was completely won over after the first bite, and I have to say, making this in your own kitchen is dang tasty. If you are an expert biscuit maker, I’d definitely recommend that. But I still wanted to eat about three of these even using store brand canned biscuits. That hint of sweetness with the spicy sausage is out of this world. Get out there and support your local businesses, but don’t cry when they’re gone. Get inspired to get into your own kitchen. 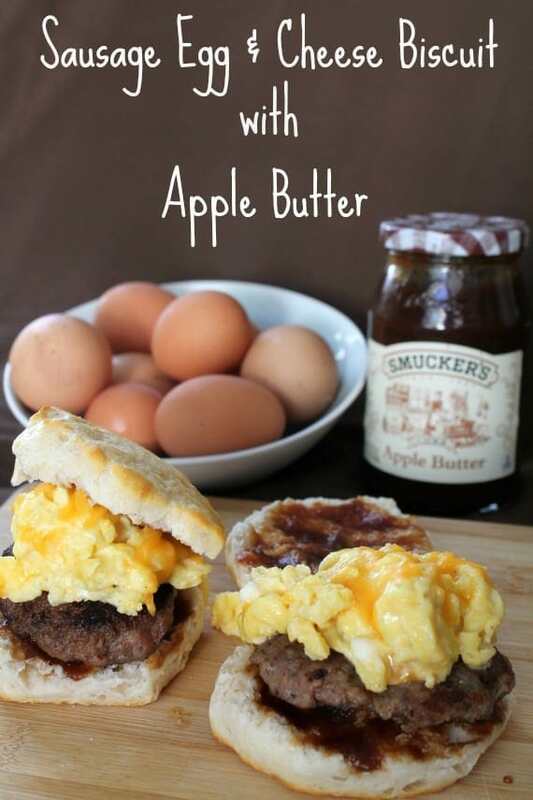 Put apple butter on your biscuit sandwich. It’s genius. 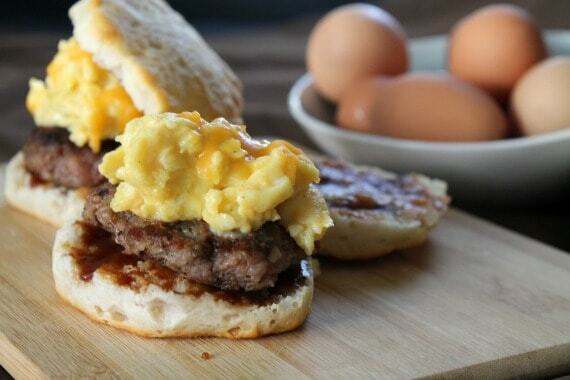 A flavorful, filling breakfast sandwich inspired by my favorite, former Southern restaurant. Preheat your oven and cook your biscuits according to package instructions. Set aside. Divide your sausage up into eight patties and cook in a large skillet over medium heat for about four minutes a side or until cooked through and brown. In a large bowl, whisk together desired amount of eggs (see note) with a splash of water and a bit of salt and pepper. Scramble eggs in a skillet, stirring and scraping the bottom of the pan constantly with a silicone spatula. This will help them stay light. Just when the eggs are set, sprinkle the cheese over the top. Build your sandwich by spreading a generous amount of apple butter onto each side of a biscuit. Place the sausage patty down first, then top it with some egg (about 1 egg per sandwich). Pop the top on, pour yourself some sweet tea, and let all the Southern happiness sink in. If you're not serving a large group, I suggest cooking all the biscuits and all the sausage, but doing the eggs as needed. You can always reheat the first two, and then quickly scramble up eggs for when you're ready to make these again the next day. You totally will be.